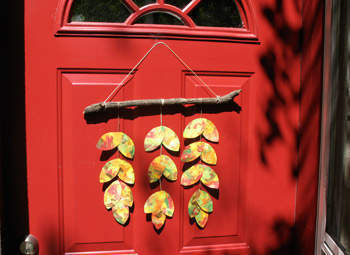 Celebrate the return of fall with a festive door decoration. Kids will love searching for the perfect stick, getting their hands dirty with finger painting, and then assembling the craft. Start with a nature hike! Find a stick approximately 12″ long. Return home and do some finger painting. Fill the white papers with swirls of color. Let the paint dry completely. Cut leaf shapes from the paintings. Cut three lengths of yarn, each approximately 15″ long. Tie them to the stick so they are evenly spaced. Tape the leaf shapes to the yarn, arranging them in pairs or trios like they would appear in nature. Cut a 20″ piece of yarn and tie each end to the ends of the stick. This will be the hanger.